Portable Greenshot is a software program whose main purpose is to aid you in taking snapshots of the entire screen, a specified region or a selected window with ease, and in uploading it to the Internet or a selected app. 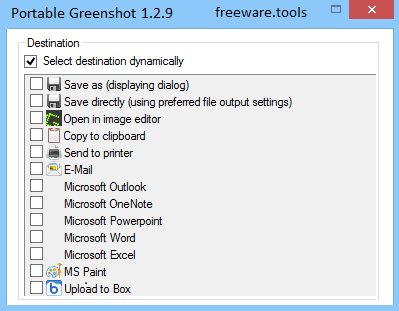 Portable Greenshot is a lightweight screenshot software tool focused on speed, basic annotation, and ease of export. The program includes an image editor, ability to output to file, printer, clipboard, e-mail, Office programs, as well as upload to photo sites like Flickr or Picasa. Includes a variety of customizations, scrolling (full page captures), auto crop, ability to use external editors, and more. This product is the portable edition of Greenshot, which means that the installation process is not a prerequisite. As a result, the Windows registry is not going to be affected in any way, and no leftovers are going to remain on the drive after its removal. Another important aspect is that you can run Portable Greenshot on the fly, by simply copying the program files to a USB thumb drive and clicking the EXE. This tool is also non-obtrusive, as it goes in the system tray from the first launch, and enables you to interact with it through a context menu. As stated above, it enables you to capture the entire screen, a custom region or a selected window, while you can also take snapshot of an Internet Explorer page. After taking a snapshot it is possible to copy it to the Clipboard, send it to the printer, e-mail it, open it in another app (e.g. PowerPoint, Word, Paint etc. ), upload it to Photobucket, Flickr, Dropbox, Imgur or other similar website, as well as save it directly to a custom location or send it to the built-in image editor. The latter enables you to highlight specific items, crop, flip or rotate the resulted picture, insert a geometrical shape or a text box, and draw freehand. All images can be saved to the HDD using a BMP, PNG, GIF, JPG or TIFF file format with just a few clicks. The computer’s performance is not going to be hindered at all, as it does not use a large amount of resources in order to function properly. The response time is good, the interface you come across is intuitive and there are sufficient options to keep you glued to you PC for a while. All things considered, it is safe to say that Portable Greenshot is a handy application for those who want to take snapshots, without having to go through an installation process.